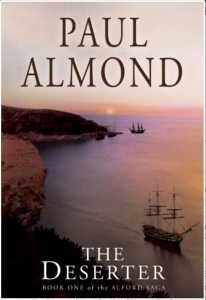 “The Deserter” by Paul Almond is a very enjoyable historical novel about a young man who jumps overboard from a British Navy ship while it lies just off the coast of Canada in the early 1800’s. He’d been waiting a long time for his chance to start over in the New World, and he had only one chance as a deserter. Now running from the British Navy and facing a completely unknown future, Thomas Manning had only the clothes on his back and a few tools to try to stay alive and start his life over. The opening of the book drew me in, as I immediately wanted to see if Thomas was able to make it off the ship. The settings were very vivid, and I felt the writing was quite authentic to time and place. The story moves along at a good pace and I didn’t feel that it bogged down at any spot. The chapters were fine reading lengths and ended at suitable break points — few cliffhangers that I remember. I liked the story and will definitely consider the next book in the trilogy. NOTE: I was impressed by the editing and the layout of the Kindle-version formatting. Unlike many e-books, this one was exemplary. Congratulations to the editor!